Share the adventure of a jungle safari in lush surroundings showcasing the grandeur of Africa. With many rooms overlooking the beautiful savannahs, grazing zebra, giraffes and gazelles can be seen roaming free in natural environments. The rhythm of tribal drums...the exquisite cuisine...the rich settings...and the lure of authentic African treasures all come together to celebrate the beauty and wonder of this vast and untamed continent. Three animal savannas are home to more than 200 mammals and birds representative of the African animal palette. Some examples are giraffe, zebra, Thomson's gazelle, ostrich, flamingo, African spoonbill, and sacred ibis. for More Resort Offers or to Book TODAY! 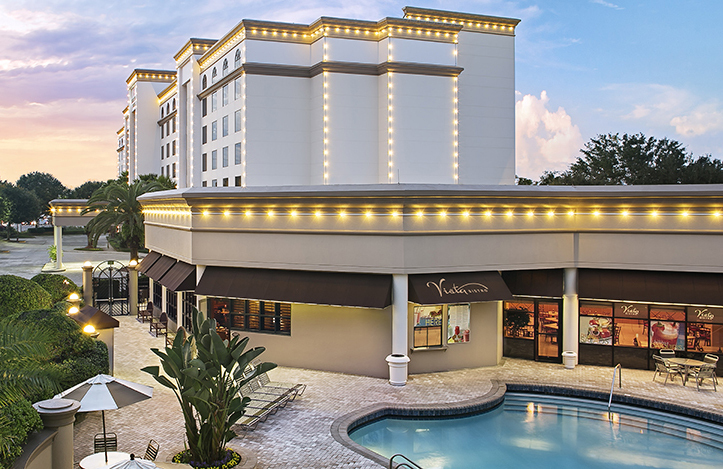 A welcoming, intimate retreat in the heart of Orlando, Florida, Buena Vista Suites offers families and business professionals the very best in spacious all-suite accommodations. Guest also enjoy a daily complimentary, signature full American breakfast buffet, personable, attentive service and desirable hotel amenities, including a sparkling pool, and the Vista Bistro  a great steakhouse. For health enthusiasts, there is an exercise room, lighted tennis and basketball courts for guests to enjoy. Spread across 53 lush, tropical acres of stately palms and fragrant Bougainvillea, guests of Caribe Royale-Suites and Villas step into a world of cascading waterfalls, lush landscaping and classic hospitality. A short drive from the Walt Disney World® theme parks, Caribe Royale-Suites and Villas appeals to families, active travelers, spa lovers and couples looking to tie the knot with all-suite accommodations; romantic wedding services; 24-hour dining options; pampering spa services; a sparkling pool complete with a 75-foot water slide and kid's play area. Just a short drive to the shops, dining and entertainment options in and around Downtown Disney®, Caribe Royale-Suites and Villas provides the ideal atmosphere for fun. 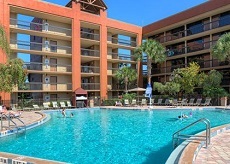 Next door to the Walt Disney World Resort®, and within ten minutes of Sea World® and Universal Studios®, the Claron Inn Lake Buena Vista provides value lodging ideal for families and active travelers alike. 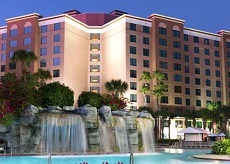 An official Walt Disney World Good Neighbor® Hotel, Clarion Inn Lake Buena Vista offers a casual cocktail lounge; buffet-style dining; an arcade and playground; a sparkling pool; a mini-convenience store selling everything from fresh pastries and sandwiches to baby food and convenient free shuttle service to the Walt Disney World® theme parks, Universal Studios® Florida and SeaWorld® Orlando. Designed for comfort, guestrooms at the hotel feature a mini-fridge and microwave and free Disney Channel to help your little ones wind down after fun-filled days exploring Orlando. 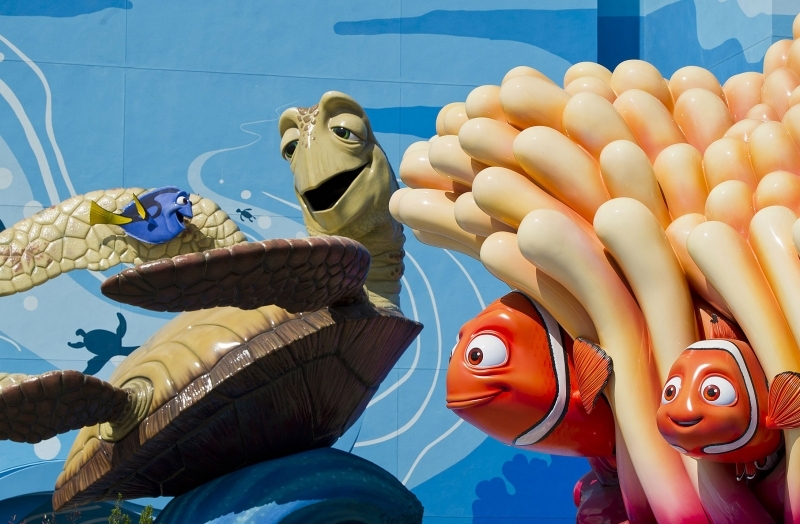 The incredible Disney's Art of Animation Resort will create for you, as never before, the sensation of being a character inside some of the most popular and beloved animated films of all time. 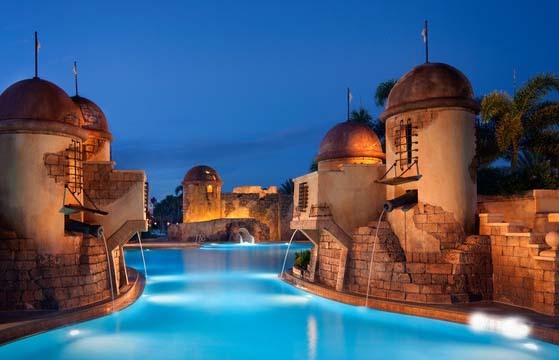 From the magically themed family suites (especially designed to accommodate up to six Guests) and rooms to the spectacular courtyards, this Resort draws its inspiration from four classic Disney Animated films: The Lion King, The Little Mermaid and Disney Pixar's Finding Nemo and Cars. Relax as lush gardens, warm breezes and the distant sound of steel drums beckon. Five brightly-colored "island" villages surround a sparkling 45-acre lake with sand beaches, heated "quiet" pools, a marina, bike rentals, and a nature trail. A lively shopping bazaar, food court, table service dining and two lounges give this resort the color of the Caribbean at an affordable price. 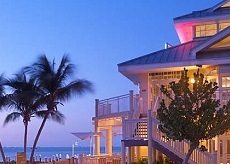 Caribbean style resort with open air piazza situated on the Gulf of Mexico in the heart of old town Key West. Offering 118 guest rooms with tiled entry foyers, private balconies, ceiling fans, some rooms offer a partial water view. The dress code throughout the island is casual resort wear. Welcome to Mystic Dunes Resort & Golf Club in Orlando, Florida. 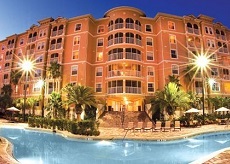 A distinctive family resort in Orlando, FL near Disney World®, Universal Studios Orlando®, and SeaWorld OrlandoTM where you'll enjoy the fun and excitement that Orlando is famous for. Our resort is in close proximity to everything Orlando has to offer while providing an escape to a relaxing, tranquil retreat of spacious condo-sized villas and a wide array of resort amenities and services, all in an atmosphere of gracious hospitality. Mystic Dunes Resort & Golf Club is just a few miles from sensational shopping and dining, perfect for your next Orlando Visit, family vacation, or holiday stay. Our resort provides much more than a typical hotel, built on one of the highest elevations in the area, Mystic Dunes is nestled on over 600 acres of rolling hills, lush Florida nature preserves and beautiful tropical landscaping. Our vacation villas and resort amenities make Mystic Dunes Resort & Golf Club one of the best family vacation and golf resorts in Orlando, Florida. Enjoy the home-away-from-home comfort and conveniences of our spacious villas. Splash away at our resort pools' 2-story water slide or simply relax in one of the private poolside cabanas on the expansive pool deck. Call your Vacation Specialist at (888) 249-5440 TODAY!